With attractive yellow flowers and good green foliage Goodenia species make a useful garden plant. The lower growing varieties or prostrate forms being particularly popular with landscapers. Species such as G. ovata, affinus and elongata are widely spread through NSW, QLD and Victoria. Other species are found in the South west of Western Australia and with such diversity in habitat and with over 170 species in the genus they are a varied group of plants. Species such as G. humilis are sold as a ground cover plant, flowering in spring with buttery yellow flowers, this species reaches around .5 m in height. G. ovata is more of a bushy shrub, reaching around 2m in height, again with yellow flowers, it is also known as the ‘Hop Goodenia’. A few cultivars are coming onto the market in Australia including a variegated foliage form called ‘Lighten Up’, a little more compact and lower growing reaching around 1m in height. 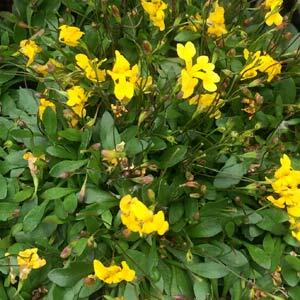 Most Goodenia species are not widely found in nurseries however species such as G. affinus or ‘de Vriese Silver Goodenia, and G. elongata which is a low growing ground cover plant are now coming onto the market. The yellow flowers of Goodenia in spring are attractive to birds and butterflys.